For those of us fortunate enough to take the Cisco Network Academy courses (Exploration being better than Discovery, in my opinion), we have an opportunity to switch our account over to Alumni status. This can only happen once we've completed the student courses successfully and the instructor has marked the Network Academy grade book with a passing grade. This switch can sometimes be an elusive task unless you know wheat you're looking for. For instance, the T.A. at my local brick and mortar community college missed out on the Alumni account opportunity. The Alumni account option eventually expires post course completion. The Alumni home page looks exactly like the student home page, but it has different options. 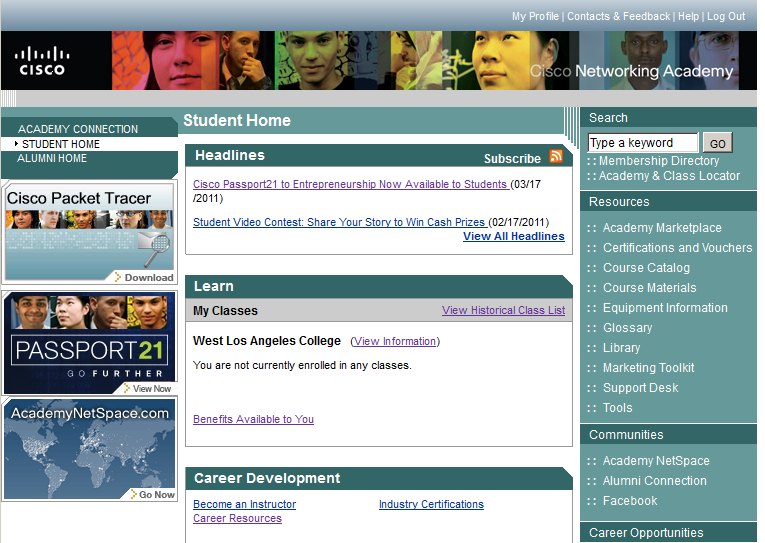 You loose the option to view the student page once your Network Academy class is completed. The Alumni home page allows access to course materials, the Alumni forums, career tools,and more. Starting back to school and finishing a school term are perfect opportunities to get registered as alumni with Cisco Networking Academy. We can show you how. Why should I register as an alumni member? Students who do not register as alumni will lose their access to Academy Connection soon after they leave the classroom if they do not enroll in a subsequent class. That means you’ll no longer be able to access the Course Materials to study for certification or re-certification. If certification is one of your career goals, you’ll want to maintain curriculum access as a valuable resource for your exam preparation. Alumni privileges include access to Course Materials (for courses you passed). Even if you’re still in class, you’ll want access to benefits available only to registered alumni. Eligible students and grads will see the Alumni Home link on their Student home page. Register now to secure your access as an alumni member. Click here to watch a brief video about the alumni registration process. For more information, send an e-mail to academy-alumni@external.cisco.com. Navigate over to the Cisco Network Academy and log in. You'll then be able to edit your information and enable "Opt-ins"
lastly click register on the "Opt-ins" page to be given 99 years of Aceademy Alumni access. Awesome. You'll eventually receive an Email letting you know you'r registered as an Alumni. That's it. Hopefully this will be helpful for someone to be able to utilize the Academy Alumni resources in the future. Nice post.D-Link Academy program is cost-effective and high quality training platform with an excellent value, and is more easily accessible by a wider audience due to the low entry barrier. Nice article i was really impressed by seeing this article, it was very intresting and it is very useful for CISCO Training Learners.. We are Providing best CISCO online training in worldwide. Good info on this post. You have shared very valuable info here.